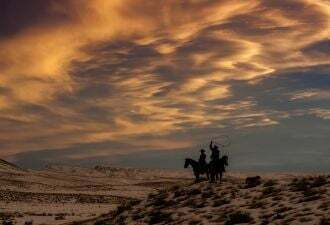 Will NextEra Energy’s Wind Be Part of the New California Gold Rush? 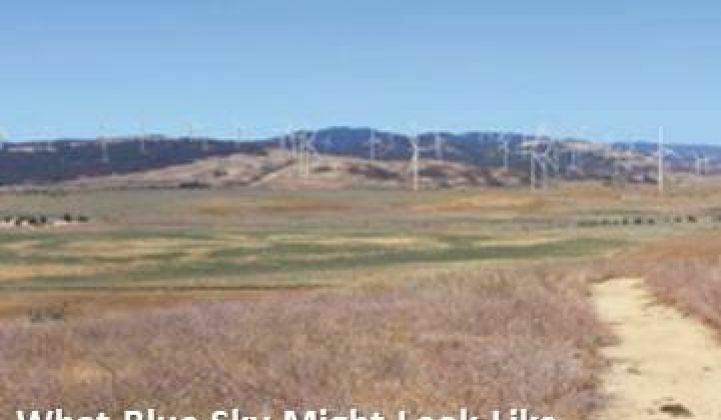 Will Antelope Valley owners of the state’s best wind resource let the developer build? It doesn’t get much better for wind than it is in California’s Antelope Valley. The resource blows hard, often at the same times that grid demand peaks. Southern California Edison (SCE) has already built up transmission capacity there and is building more. The land from the western slopes of the Tehachapis to the eastern slopes of the San Gabriel spurs used to be farm and grazing land and is still underpopulated, which means projects don’t necessarily result in major environmental impacts or lifestyle disruptions. The California Energy Commission named the Valley a Competitive Renewable Energy Zone (CREZ), which means it couldn’t be much riper for development. NextEra Energy Resources, one of the U.S.’s biggest renewables developers, agrees. It has applied to the County of Los Angeles for permission to build the Blue Sky Wind Development on 7,000 acres of the Kings Canyon/Portal Ridge area. 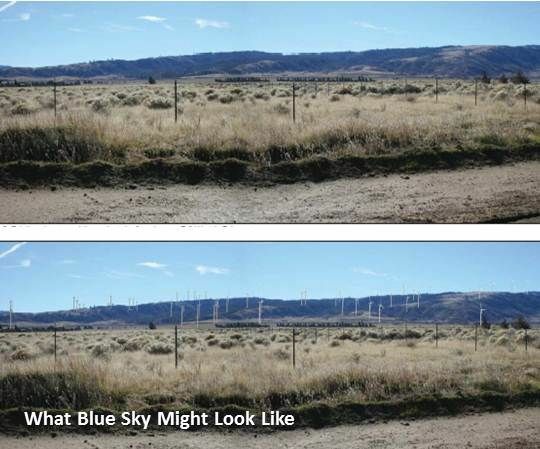 Blue Sky would have 94 turbines and generate 200 megawatts. It would, NextEra Energy estimates, provide 200 to 300 jobs during the 8- to 12-month construction process and permanent operations jobs thereafter. The $3 billion SCE transmission development brought wires to within two miles of Blue Sky and a substation is being built. NextEra Energy filed its application for a Conditional Use Permit (CUP) with the County in April and expects a Notice of Preparation (NOP) within 30-60 days, which, Stengel wrote, will initiate the California Environmental Quality Act (CEQA) Environmental Impact Report (EIR) process. Permission for the project will probably be taken up by the County Board next year. NextEra project developer Cliff Graham has already established a well-received presence in the Valley. Most developers -- and the Gold Rush to meet California’s newly instituted 33 percent renewables by 2020 has brought hordes of them to Antelope Valley -- wait until later in the process, when locals have fewer options and less time to object. The company began by showing leaders of the local town councils a copy of the Blue Sky CUP application and taking and incorporating feedback. 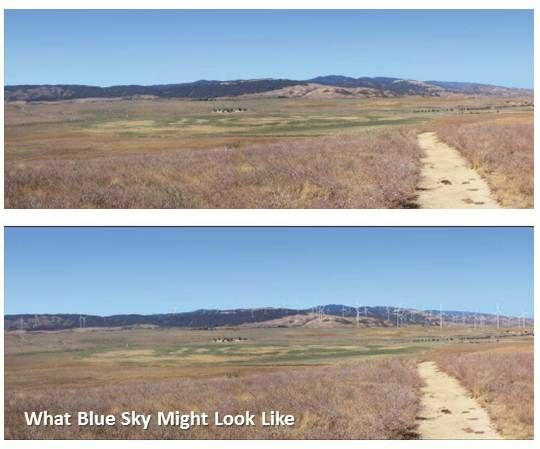 In addition, “the Blue Sky team is committed to working with the local community,” Stengel wrote, “to create a local benefit package that is both reasonable and will help to improve the quality of life of our neighbors and neighboring community.” Preliminary discussions about protecting some of the land are already ongoing. That certainly is where the challenge is. At the most recent Fairmont Town Council meeting, a series of residents stood during the comment period to rant about the evils of wind. Judy Watson showed a chart that listed widely-repeated claims made against wind, including that it does not reduce greenhouse gas emissions, that it cannot survive without disproportionate federal subsidies, that turbines are misleadingly inefficient and create health problems for those who live near them. They are claims the facts to do not support, but which often resonate with people who simply don’t want to live with turbines. “We’re going to look like Tehachapi,” Watson warned fellow Valley dwellers, referring to the high density of turbines built in one of the oldest of California’s utility-scale wind installations, a density almost never built anymore, nor planned for Blue Sky. “Turbines do not belong on Portal Ridge or at the poppy reserve,” declared Susan Zanter, who went on to argue that coal was potentially preferable. “This is something we can stop,” Cindy Romano told her fellow Valley residents. Attorney David Jefferies, the Fairmont Town Council Secretary, said he has heard promises from developers before and wondered just how much Blue Sky’s builders are willing to commit themselves. Wherever they build, Stengel said, “NextEra Energy strives to be a good neighbor” and, in the Antelope Valley, “if that means that the community is looking to provide input in defining the project and working with us on a benefits package, including visual mitigation, we will make the effort” to work with them.